This week’s Doctor Who episode saw the Doctor and Clara rob the most secure bank in the universe and was perhaps the best episode of season 8 thus far. This isn’t exactly a mean feat, given that all previous episodes have been pretty lacklustre, and there were definitely points for improvement in this episode, but it’s hopefully encouraging for where the series is headed. More on Time Heist under the cut! Time Heist begins with the Doctor trying to convince Clara, who is getting ready to go on a date, that she should come exploring with him instead. Ordinarily, I wouldn’t need to get into the dissection so quickly but this beginning sequence was so annoying I groaned out loud. This whole Danny Pink/Clara Oswald dating routine is plainly crass. Not only does it feel completely insincere and forced, but it doesn’t seem to have a place in the overall show. Previous boyfriends of companions were worked in far better. I can’t say I am a fan of the trend that the companion has to have a romantic interest in someone else to be able to be friends with the Doctor and not be in love with him. God. I miss Donna. Couple this with the fact that Clara is wearing a weird pant-suit and tie, which makes no sense for her character’s style of wearing vintage dresses and cute boots, and it feels like the character has completely jumped the shark. I read recently that the Governess Clara what we saw in the Christmas episode The Snowmen was going to be the series companion. I cannot believe they decided to go with a watered down version from the 21st century who has only gotten less interesting as the show has progressed. Thankfully, the Doctor’s phone rings and both Clara and the Doctor find themselves memory wiped in a concrete room with two strangers. It turns out, they have all agreed to rob the most secure bank in the universe, The Bank of Karabraxos, and have also agreed to have their memories wiped as a form of protection. A video left for them reveals an Architect, who instructs them on how to enter the bank and where to go. 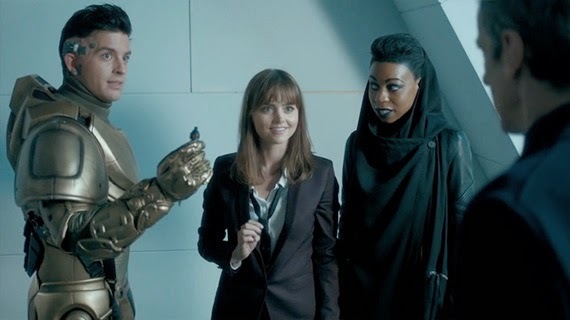 Clara and the Doctor’s heist companions are Psi an augmented hacker who can erase his own memories and plug computer tech into his brain and Saibra a woman with a mutant gene that allows her to shape shift. Pursued by the banks security, the group witness first hand what happens to those who enter with ulterior motives. A creature called the Teller feeds on a guilty mans memories and thoughts, rendering his brain soup. He is taken away to be put on display for others who might attempt to rob or in any way be dishonest about their purpose in the bank. During their quest for whatever the Architect has sent them to find, we discover more about Saibra and Psi. It’s nice to have the Doctor and Clara working as part of a team and developing relationships with other people. They seem like interesting characters too. Saibra is unhappy because she can never touch anyone without appearing like they do. Psi, once caught for his felonies, purged all memory of his friends and loved ones to keep them safe. He too leads a really lonely life. The group discover another briefcase left by the Architect with six devices inside. 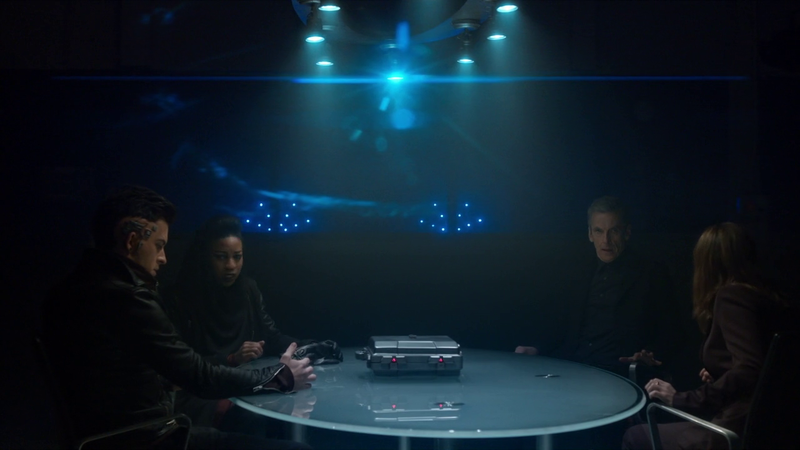 The Doctor claims that he doesn’t know what they are, but Saibra knows that he is lying and tells him as much when they discuss what might have drawn her to participate in this heist. In one of the chambers of the bank, the group stumble on the Teller in hibernation. He locks onto Clara’s thoughts and attempts to feed on her. The Doctor manages to get her free at the last moment, only for Saibra to be caught in the Teller’s telepathic gasp. Saibra asks the Doctor for one of the devices, which she has considered is a method of humane escape. The Doctor confirms this and gives her a device, which she uses to atomise herself. Ms Delphox, the manager of the bank, sets the Teller into the tunnels to try to catch the remaining intruders. While the Teller hunts them, the Doctor gives Psi a device in case he too falls victim and needs a more humane escape. Clara is mortified at the Doctor’s cold and uncaring response to Saibra’s death and also to dealing out these death devices rather than finding a solution where everyone can live. She tells Psi to promise not to use the device before splitting up with the Doctor to try to draw the Teller away from Psi. Soon though, the Teller advances on Clara’s position and locks onto her thoughts. In this instance, it is Psi who comes to her rescue, uploading the memories of thousands of criminals throughout history (it was cool to see John Hart!) into his own brain to distract the Teller. When the Teller locks onto him, Psi uses his device and atomises himself. Clara cannot believe that the Doctor once again does not seem to care at all, but follows him into the vault when a solar flare disrupts internal security and functions. Inside they discover what both Saibra and Psi had wanted and why they had agreed to the heist. Saibra’s payment was a serum to neutralise her mutant gene so that she could touch people and Psi’s was a means to access his lost memories. 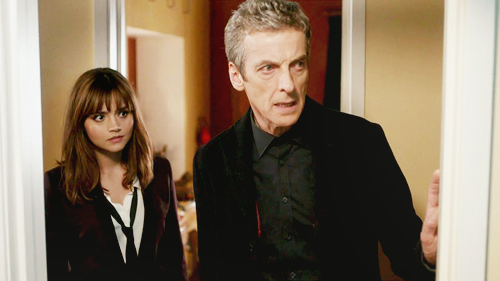 There is one payment left to discover; that for the Doctor and Clara, which they are told is in the private vault. Before they can reach the private vault though they are captured by Ms Delphox and are given to the guards for execution. To their surprise, the guards are revealed to be Saibra and Psi. The atomisers are instead teleportation devices taking them to a ship in orbit (that is also housing the TARDIS) and allowing them to return for Clara and the Doctor. Before they leave though, the Doctor wants to see what is in the private vault. Within the private vault the group meet Madame Karabraxos and are stunned to see that she looks exactly like Ms Delphox. She is a cold-hearted woman and has been using clones of herself to run her bank. She orders Ms Delphox fired and incinerated for her incompetence and when the group wonder how she can do such a thing to her own clone, the Doctor realises something about the Architect. He writes on a slip of paper his TARDIS phone number and that he is a time traveller and allows Madame Kalabraxos to leave the bank. The solar flares are about to incinerate the entire structure but the Doctor is waiting for someone. 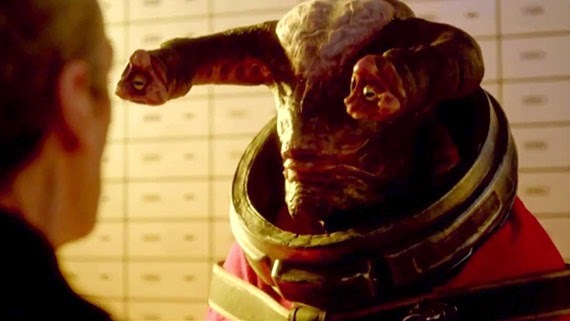 When that someone arrives, it is the Teller and the Doctor wants his mind and memories scanned to remember what he has forgotten of why he and Clara agreed to come to the bank and partake in the robbery. It is revealed that he is the Architect and that this was in fact a rescue mission. With Kalabraxos gone, the Teller can save its mate from her captivity and doesn’t have to live alone or in torment. It turns out it was Madame Kalabraxos who called the Doctor in her dying moments with regret that she had left the Teller’s mate locked up and therefore, the Doctor planned the heist to coincide with the solar flares – a time heist. The Doctor takes Psi and Saibra home before dropping Clara back just in time for her date with Danny Pink. He’s chuffed with himself, convinced that robbing a bank is far more interesting and fun than anything Clara could get with her date. Okay. Now that we have recapped, there are some things I need to break down. This episode is definitely much better than the previous four of the season but it still has moments head-hitting annoyingness and major out of character sequences. Overall, the episode is paced poorly. It feels like this episode probably should have gone longer to get everything that was packed into it flowing better and to truly utilise some of its key players. Maybe all that fluff about Danny Pink and dating at the start could have also been cut. It makes the episode frustratingly jarring and the style of editing doesn’t help that either. Stylistically though, the cinematography is beautiful and the characters in the Karabraxos Bank feel three dimensional and menacing. Clara’s relationship with the Doctor continues to perplex. No matter that at the beginning of the season she agreed to stay with him and he told her he wasn’t looking to date her or impress her, they continue to play out the opposite of those sentiments. Clara, out of nowhere, seems to care very little about the Doctor or travelling with him and certainly doesn’t seem like the girl who agreed to stay with him of flung herself through space and time to save him, or even the girl who told a crying time lord to be brave. The Doctor on the other hand seems to spend all of his time chasing her like a puppy and trying to impress her. He acts both jealous and disinterested and neither work. The episode is clearly about loneliness and this is what each character is trying to overcome in their own way. Clara is obsessed with her life with Danny and what it might mean after her trip in the TARDIS that seems to indicate he is ‘the one’ (God Moffat – is this really how you think women behave around men they like?). She is determined to make this relationship work despite knowing next to nothing about this man and seems way too invested. Psi wanted his memories of his loved ones back, perhaps in order to see them again. Saibra wanted to be touched and loved by anyone, which is why she went into the bank, the loneliness was too much for her to bear. The Doctor himself is desperate not to be alone anymore, and there is a wonderful beat where Saibra hugs him and he doesn’t respond the way he does to Clara and he looks so shell shocked as he touched his arm where she hugged him, aware of that closeness that he misses. The Teller and its mate are no longer doomed to walk alone through the world, and no longer is one considered the last of its species. This of course seems directly related to the Doctor but lacks any punch now that we know that the Time Lords are still alive. Nonetheless it is probably more of a clue that Missy may be the Master. 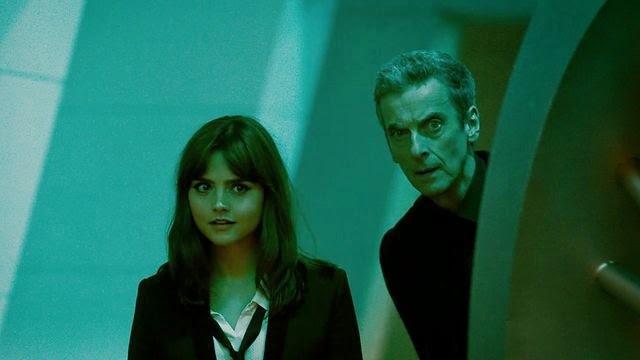 I guessed right at the beginning of the episode that the Architect was the Doctor so I can’t say I was totally thrilled by the reveal, but what was most disappointing was that it didn’t make sense how the Doctor could have planted some of those briefcases and clues as the Architect had. And if he could get in, why did he need such an elaborate ruse to execute his plan? Moreso though, the main thing that annoyed me about the Doctor being the Architect is that he once again mentions his hate of himself. The fact that he cannot stand himself this season seems like a valid line of development and enquiry but is being done with a hammer rather than organically or with any logical and emotional flow. Capaldi’s characterisation isn’t one of self-loathing. It’s much more confident than Eccleston or Smith’s Doctor’s. Much more in the vein of Tennant’s gusto and swanning into a room to solve a problem; which had it’s own drawbacks. It seems strange that he hates himself and it just doesn’t work. His detachment to death and loss is also out of character and frankly doesn’t make him easy to engage with or relate to. No wonder Clara can’t be bothered hanging out with him! It makes the viewer less excited to get into the TARDIS and explore the universe with him, but worse, they don’t want to comfort him either. I thought Saibra and Psi were fantastic though; really great additions to the episode and really interesting characters. The scene in the TARDIS where they were all eating Chinese was priceless and fun and made me feel like they might have gone and seen a few more sights together before they went home. Why can’t we have those guys back!?! Why does it have to be stupid Danny Pink!?!? Exploring the idea of loss through different lenses and making the Doctor not seem all that special for him perceived loss does add a whole new dimension to what the Doctor can learn from humans and why he is so interested in Earth and humanity. 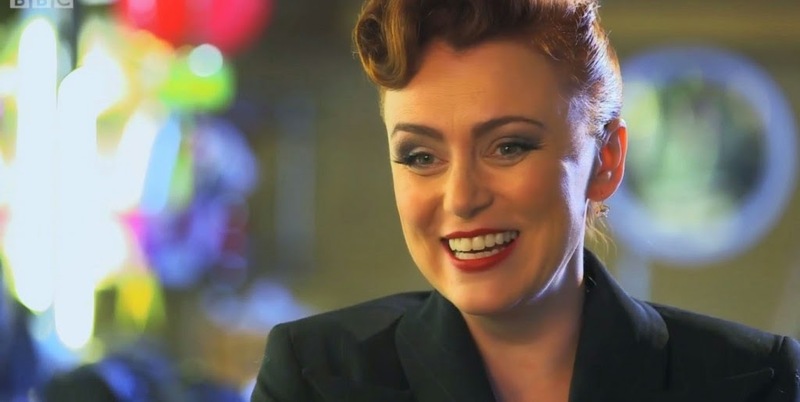 Keeley Hawes who played Ms Delphox/Madame Karabraxos was wonderful but completely wasted. She is such a stunning actress and has such depth capabilities that I have no idea why she’s not just brought on to be a companion. COME ON BBC! Capaldi and an older woman companion! She would be fantastic. As it stood, she gave as much depth to her limited characters as she could. All of this has made me determined to watch the Ninth Doctor’s season again and maybe even review it. It is seriously fantastic and considering that this season is trying to replicate so much of it, it seems relevant. Paul Verhoeven said in his review that he hasn’t been this excited about the Doctor working with a group since the Doctor/Rose/Captain Jack/Micky team up at the end of the Eccleston season. While I am not sure I totally agree with that – I’ll have to check what others there have been – he’s not far off the mark. The team ups in the Eccleston season are by far the best ones, the ones that immediately spring to mind. The Dcotor gets to be at the centre of this group of people saving the day, but it’s the fact that they are capable people, that they are some of the best aspects of humanity, that make those episodes truly special. Text week looks truly awful. More Clara and Danny Pink trying to date and Clara needing to reconcile her life with the Doctor and her luurrrve life. Hurl.